I can't believe it's already November. I know, I know. I always say that. But when I sit back and think, it feels like I just bought my 2018 wall calendar. It's insane how fast this year has gone by. I am looking forward to a new year, but I need time to slow down if only so I can enjoy the last moments of my favorite time of the year. Give me fall, the very beginning of winter, and all the holidays. It's just THE BEST. I've got Poppy's new album playing as I type this. I'm not sure I'm quite on the Poppy train, but she does have some catchy tunes. Have you listened to her or watched some of her strange videos on YouTube? It's kind of funny, because her song Fashion After All is playing currently just as I was about to tackle that subject. I used to share more OOTDs before my knee injury and then...well, I just kind of stopped or at least did not do them as frequently. In the early days, it's because it was hard to stand and pose. I realized that I have rather missed sharing outfits and fashion more frequently. I mean, that's where my blog name comes from! So now on my Instagram, I'm making one day a week (at least!) be an OOTD or something related to fashion or style. Right now, it's Thursdays unless I have a different #TBT to share whatever week. The Instagram algorithm has been failing me recently, so I have actually found it easier to take the pressure off of myself of having an extremely cohesive feed. It's just so limiting. 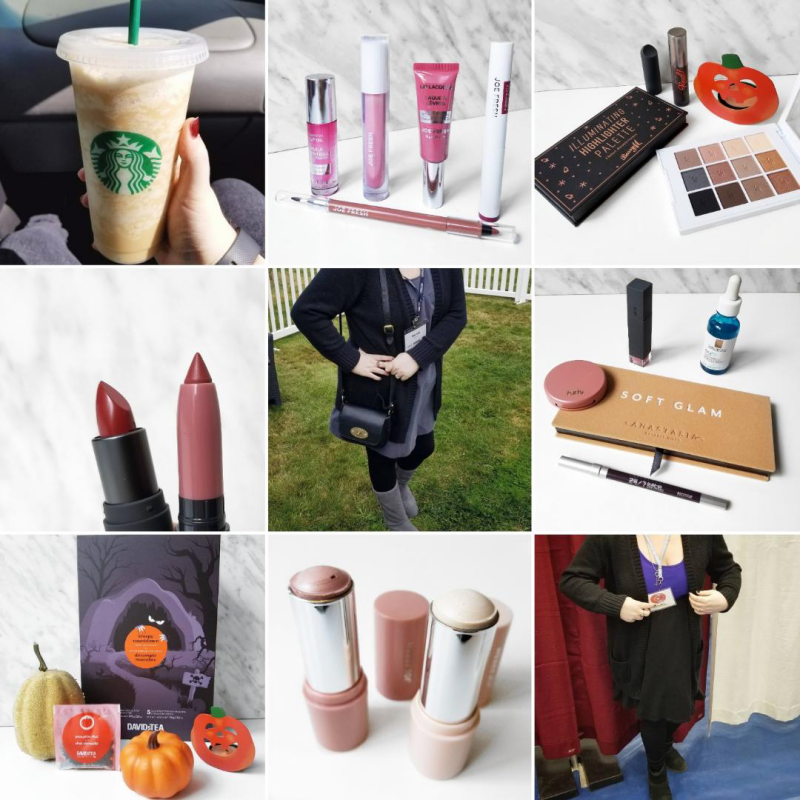 Here are a few pictures from my Instagram during October! 1. Did you know they'll blend any coffee to give you a frap texture? New fave. // 2. A few new lip goodies by Joe Fresh Beauty. // 3. Gah, this palette! 4. Bite Beauty Glace and Chai. // 5. An event at the horse track. // 6. September faves. 7. DAVIDsTEA put out a Halloween countdown calendar. So fun! // 8. Joe Fresh Highlight Sticks. // 9. Craft show OOTD for Warm and Fuzzy Knits.